Have you ever had one of those weeks where everything big and important in your life, both fun and stressful, comes to a head all at once? And you feel like your head might explode from the chaos? For me, that was last week. Luckily, most of it was fun: a concert, a wedding, a visiting uncle, lots of great restaurants, trips to Portland and Seattle. But there was definite sleep deprivation involved. One of my favorite feelings in life is the calm after the storm; reflecting back on everything that just happened, and entering a relative vegetative state for a day or 2. Those days are often when greatness happens in my kitchen, and that's how this Chicken Piccata was born. It felt like such a luxury to take a whole afternoon and evening earlier this week to pore through cookbooks, plan a meal (this chicken, served on a bed of sauteed spinach, and pasta with my go-to marinara sauce from scratch). Before I got into cooking last year, I used to consider playing in the kitchen a chore, something that took time and energy that I didn't want to "waste." I love that now, I feel the complete opposite. At the end of a long day, all I want to do is get into the kitchen and create something. Oh, maybe I should say something about the chicken, eh? Rave reviews all around. It's supposed to serve 4, but the 2 of us took it down easily, it was that good. My first time serving anything on a "bed" of spinach. Watch out world, I'm getting all fancy-pants! 1. Adjust an oven rack to the middle position and heat the oven to 200F. Spread the flour in a shallow dish. 2. Pat the cutlets dry with paper towels, then season with salt and pepper. Dredge through the flour to coat and shake off any excess. 3. Heat 2 tablespoons of the oil in a large skillet over medium-high heat until just smoking. Add half of the cutlets and cook until light golden brown on both sides, about 2 minutes on each side. Transfer to an oven-safe plate and keep warm in the oven. Repeat with remaining oil and cutlets. 4. Add the shallot and garlic to the oil still left in the skillet and cook over medium heat until softened, about 2 minutes. Stir in the broth and lemon slices, scraping up any brown bits, and simmer until reduced and slightly syrupy, about 8 minutes. 5. Stir in the lemon juice and capers if using. Turn the heat to low and whisk in the butter, one piece at a time. Off the heat, stir in the parsley and season with salt and pepper to taste. Spoon the sauce over the chicken before serving. I totally know what you mean! Sometimes getting in the kitchen can heal, relax and be fun all at the same time! The chicken looks great =D. I love when time slows down uncharacteristically and you get to just sit back and look through cookbooks and make a nice meal. Beautiful dish! YUM! Can you make it for me please? i'm not a big chicken lover, but this looks SCRUMPTIOUS!!! i can practically smell the lemony goodness! This looks sooo good! Great photo. Glad you were able to have some fun in the kitchen after your long week! mmm...this looks good. will have to make it for the family. Wow! It looks so wonderful on its bed of spinach. Great picture. 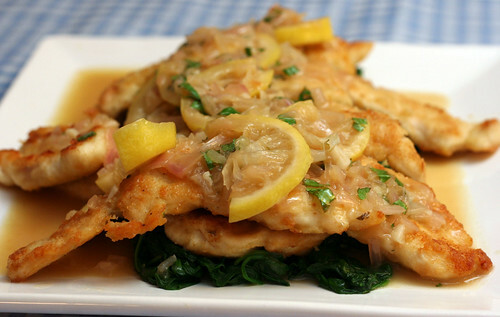 mmm, love chicken piccata, but don't get to make it too often as my hubby isn't the lemon fan that I am. Never tried it on a bed of spinach before - will have to give it a try that way next time.